Here’s a creamy, rich, one-pan, stroganoff that comes together in under 30 minutes. So simple, versatile, delicious, and vegetarian…for the win! In a large, nonstick skillet over medium-high heat, add butter and olive oil; heat until butter melts; add shallot and garlic; sauté until slightly tender (about 3 min). To the skillet, add mushrooms; sauté until tender and lightly caramelized (about 10 min). Add flour; stir and continue heating until veggies absorb it (1-2 min). Add vegetable broth, black pepper, and salt; whisk to incorporate; bring to gentle boil; reduce heat to simmer; continue whisking as needed until sauce reaches a creamy consistency. Cover; remove from heat; serve immediately over cooked pasta noodles. For a more traditional stroganoff, garnish with a dollop of sour cream. 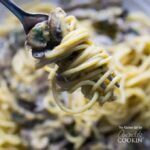 This recipe for Mushroom Stroganoff Skillet-Style was printed from AmandasCookin.com - https://amandascookin.com/mushroom-stroganoff-skillet/ and can only be printed for education or personal use.